What's in a name? A lot, actually. Our identities, first impressions, definitions, and often lasting judgements come with names. Some people wait until a baby is born to give the child a name that fits the budding personality. Names are actually rather important. That is why we are changing the name of...a Kreinik color. Sure it sounds super trendy, like a character in a Star Wars movie or a superhero flick—or a Pokemon city. However, the reason for the change is simply to identify it with its color family: the Vintage line (hence the "V" in the color number). We really don't know what we were thinking when we named this antiqued, soft-hued, innocent version of chartreuse "Adventure Green" when it is obviously a more refined and elegant Vintage personality. 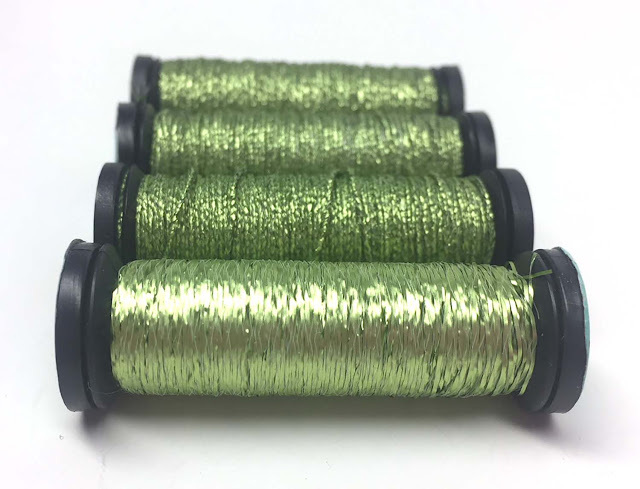 After much research and discussion, we felt Viridian reflected it's true nature, being an old-world, medium green, a timeless spring that spans centuries. As a metallic, this beauty has a muted finish, an antiqued look, almost a luminescence that's beautiful in designs. 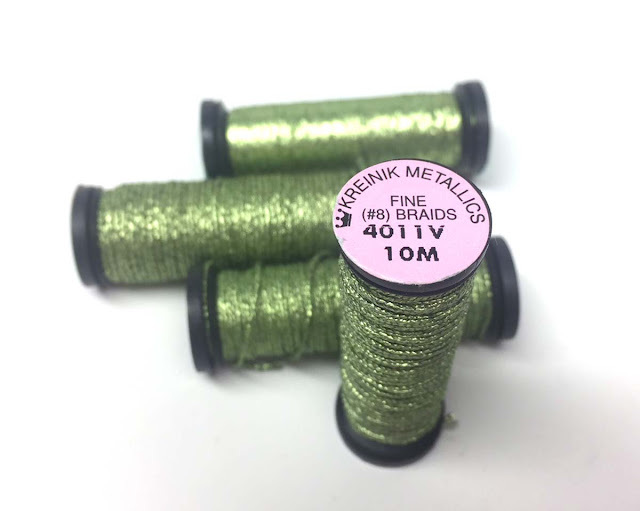 This color comes in Kreinik Blending Filament, Braids and Ribbons. We have updated our website to reflect the new name, but older color cards still list it as Adventure Green.